Dark-strong-sour beers have some serious magic in them. They age gracefully practically forever, developing deep complexities. De Dolle Oerbier Special Reserva is one of my favorites: tart, vinous, blue-cheesy, warming (but not hot, despite 13% ABV), and lightly oaky. Russian River Conseration, BFM Abbaye De Saint Bon-Chien, The Lost Abbey Cuvee de Tomme, and Boulevard Love Child are a few others worth seeking. For the first Modern Times brew-with-Mike Kickstarter reward, I decided to brew something along the same line. I don’t know the recipe for the base Oerbier, but I’d assume a selection of specialty malts and some candi syrup are involved. In a beer like this, the specifics of the fermentables aren't terribly important as the bugs and wood will change their character. I also aimed for substantially less alcohol (8-8.5% ABV) to make it something I can drink with a bit more regularity. For almost their first 20 years, De Dolle pitched a culture they picked up at Rodenbach. When the source dried up, they continued to repitched the culture, which eventually resulted in bottles exploding as the yeast became more attenuative and alcohol tolerant. The remaining bottles were transferred to used red-wine barrels to create the first batch of Stille Nacht Special Reserva. The result was so good they've released several versions of Stille Nacht like this (although I enjoy Oerbier Special Reserva more). A house Brettanomyces strain for these beers was re-cultured from an old keg returned from Finland. Luckily the De Dolle's brewer’s yeast strain is purportedly available from Wyeast (3942, Belgian Wheat), unluckily the night before brewing I managed to knock my precariously balanced 5L flask off my under-sized stir-plate. A good reason to always keep a selection of dried yeasts on hand! Rather than risk pitching bottle dregs from such a strong beer, Nick from The Yeast Bay offered to culture and isolate the dregs from a bottle of the 2012 vintage that I shipped to him. The two yeasts he isolated turned out to be not particularly attenuative, which may not be the worst thing for a strong beer like this. I pitched both strains because multiple Brett isolates generally preform better than one. I saved some of each culture for single Brett trials when I get to it though. I added a few Port-soaked oak cubes I’ve had sitting in a mason jar for a couple years when I racked to secondary. I always have oak cubes sitting in a variety of liquors, ready to add when I need them. Another nice thing to have on hand. Hopefully this batch turns out well, we've got 30 bbls of a similar recipe (with different microbes) aging in red wine barrels at the Modern Times Beer Fermentorium! 0.63 oz. Palisade (Pellet, 6.50% AA) @ 60 min. 11/13/13 Made a 3 L stir-plate starter of Wyeast 3942, nearly 3 months old. Started quickly. 5 gallons of mash water, w/ 3 g CaCl. 4 gallons sparge water with 3 g of CaCl. 2 tsp of phosphoric acid added to the batch sparge. Collected 7 gallons of 1.053 runnings. Added D90 candi syrup. Chilled to 70 F. Added 1 packet of T58, and pitches of two isolates from Yeast Bay of De Dolle Oerbier Special Reserva (DDOSR C1, and DDOSR C2). 12/7/13 Racked to secondary with 1 oz of Port-soaked French oak cubes. Added dregs from Modern Time Empty Hats as there wasn't much funk. 9/10/16 Bottled resulting 4.5 gallons with 92 g of table sugar. 5/15/17 Tasting notes. FG 1.011, ~8.5% ABV including the cherry concentrate. Hope it turns out well. How can someone who lives in the DC area, myself, get to try any of your beer? Will any of the modern times brews be available in the area in the near future? The dark sours are definitely a complex and delicious brew. I brewed a dark sour last year, based on the Bruery's Tart of Darkness, using Wyeast 3763 Roeselare. It has a "normal" ABV in the 5-7% range. It was so good I have another batch aging in the basement. I've never tried the Oerbier Reserva, but I'm intrigued by the high ABV. A single pack of the Roeslare blend obviously won't be able to hand the high gravity, and given the variety of bugs I don't think a starter would work out too well. I'm interested in your thoughts on a work around or staged fermentation process for a high octane dark sour that takes advantage of one Roeslare slap-pack. I've had excellent luck with 3942, and actually think it is fairly similar to De Dolle. If you underpitch it, it is astoundingly fruity, but at the right pitch rate, it's a very nice complex Belgian ester profile. 3) Kris has never brewed any "wheat beer". Why should Wyeast guys have ever called the DDB yeast as "wheat"?!? No meaning... Who was the person who said that 3942 IS DDB yeast? Which insight? The fun thing about Brett is that it really changes the ester profile of a beer, which is also why I'm not too worried about the T-58 sub anyway. I'm often at DC Homebrewers meetings with my beer, come on out! I always pitch brewer's yeast in addition to a souring blend or dregs. Generally all together in primary. For a bigger beer, I'd just pitch more. I'll say Wyeast often gives their yeast confusing names. Their Biere de Garde strain was sourced from Soy, Belgium... where Fantome is. I linked to the listing of yeast origins, but I don't know where they got the info. It could be that the culture was originally cultured from De Dolle, but has shifted or needs to be used in a specific way (rate, oxygen, temperature etc.). (2) rack to glass secondary and pitch some form of brett. Is this a good way of going about things? Can I just pitch a vial of Brett into the secondary, or does this need to be cultured up as well? Is the glass secondary a good idea, or should I use something that will give it a bit more oxygen? Is this something that will take weeks or months before bottling after the Brett addition? Thanks! My preference is to pitch the standard amount of brewer's yeast you would for a clean barleywine, along with whatever additional microbes you'd like in primary together. This will give the Brett and bacteria time to get rolling without all that alcohol. No need to make a starter with the bugs. If you want sourness, you'll need to pitch lactic acid bacteria in addition to Brett (which is mostly responsible for the fruity/funky aromatics). You need to wait until the Brett has gotten going and then the gravity has stabilized. For a big beer like this, I'd say 6 months is the minimum. It'll improve with age though, so I wouldn't rush it along. Just curious, with your experience, what do you anticipate the aging time will be in the secondary/bottle before it is drinkable? The last dark brett beer I made was about 3 years before it was at its peak 18mos in the secondary. I'll probably go 9-12 months in secondary, then at least three months in the bottle. It'll probably improve for years after that, but hopefully it's drinkable 12-18 months from brew day. Interesting note about having soaked cubes on hand. I know you've talked about this before, but do you boil cubes before soaking? And what else do you have soaking at the moment? Scratch that question. I found it somewhere else on the site. I'm going to start soaking the cubes I have. That's a great idea. At two months the brewer's yeast is likely still doing alright (assuming the pH hasn't dropped really low or anything). What is the gravity now? The bacteria may not need a meal, and the Brett will do its thing without much sugar. Certainly no harm in adding it now, but if you want to feed the bugs, I'd wait a couple more months. Any update on this one, Mike? Never tried Oerbier, but I read about it and was inspired to blend my clean Quad with a pale sour and let it referment in secondary. The blend was 10%abv and a very enjoyable 3.5 pH... though I suspect it will get drier and more sour. The Reserva isolates just didn't seem to do much sadly, haven't pulled a sample recently. Should check back. Glad yours sounds like it is on a nice path! Curious what ever happened to this brew? Love the Riserva and hope to sour/brett a portion of a quad I have that's about to hit secondary. May just brett a gallon or so and then blend in blonde sour/lambic to get acidity vs. hoping any bugs can do much to the 10% beer after primary. Still in secondary! I added some cherry juice concentrate recently and it seems to be turning a corner, I'll probably bottle this spring if it tastes good. Hi Mike, any update on how this one turned out? Our homebrew club is getting ready for a group brew-day to fill a barrel that the generous owner of the brewery let's us keep there. We've been talking about an Oud Bruin and this recipe looks very promising. The microbes let me down on this one! Added some dregs, and then cherry concentrate not too long ago, and it is tasting pretty good. Hopefully get around to bottling once things calm down post-NHC! Hi Mike. Any news on this one lately? Thinking of copying your base recipe. I'm bottling a saison made with Belle Saison yeast, YB Beersel & some Crooked Stave dregs soon and want to use the cake on something dark. 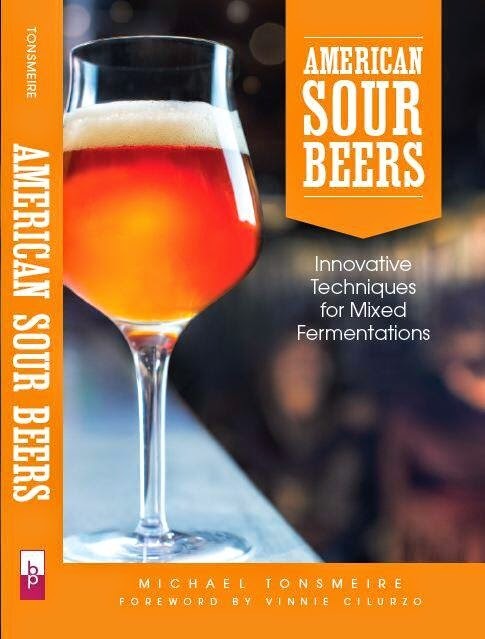 Thinking kettle souring first and then pitching my microbe cake. Any advice or caution? I keep dropping the ball on posting the results for this one. I did talk about the process and finished beer with Drew for the third episode of Brew Files. I also shared it with a few friends who rated it on Untappd. Could be interesting, but Belle can be aggressively attenuative. I'd worry about drying out a big/dark beer too much. Agreed on the Belle, that was my main worry. It dried the saison down to nil almost and definitely don't want that in a beer like this. Will try a new microbe and yeast combination because I like the look of this. have to say, had this beer at the class and I thought it was fantastic. Any suggested substitutes for the scott labs yeast? Scott Labs? The Oerbier Reserva isolates from The Yeast Bay really didn't do much; bottle dregs from them or a dark sour of your choice would do nicely!